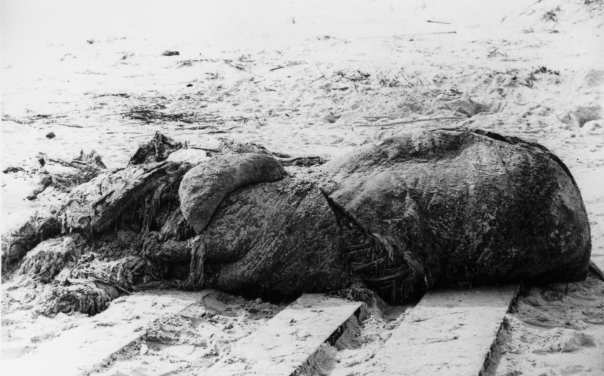 On November 30, 1896, two young boys, Herbert Coles and Dunham Coretter, were bicycling along Anastasia Island, near St. Augustine on the Atlantic coast of Florida, the United States, when they noticed an enormous carcass half buried in the sand, apparently washed from the sea. The boys thought it was a whale, and reported their discovery to the local physician, Dr. DeWitt Webb. Dr. Webb visited the carcass the next day, and discovered that it was not a whale. But he couldn’t say what the mass of badly decomposed flesh was. There was no defining feature, no bones, no eyes, and no appendages that he could identify. Dr. Webb noted that the carcass was very pale pink, almost white, and had a rubbery consistency. Dr. Webb, who would be the only person of an academic background to see the specimen in situ, estimated that the carcass weighed 5 tons. After many hours of inspection, Dr. Webb conjectured that the carcass was that of a giant octopus.